KUALA Lumpur’s newest hotel, Doubletree by Hilton, opened its doors just before the dawn of Ramadan to welcome guests to a casual and relaxed evening of food, drinks and music. The excitement of its opening was seen on faces of staff, who worked tirelessly to prepare Hilton Worldwide’s latest hotel to fit into the city’s landscape of international hotel chains. 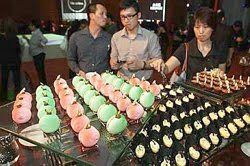 The landmark location at the busy junction of Jalan Tun Razak and Jalan Ampang welcomed hundreds of guests including officials from embassies, business leaders, company executives and the media to its opening at the grand ballroom. Hotel general manager Ian Barrow said the first Doubletree property in South-East Asia started off as a dream but its opening signalled the reality of being able to offer Doubletree’s services to guests. 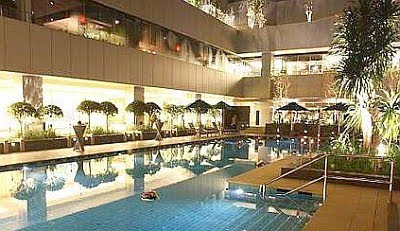 Dive in: Tosca overlooks the pool on the 10th floor of the hotel. Barrow thanked his team for their effort in readying the hotel for the event and also spoke of the famous chocolate chip cookies that was served hot to check-in guests at the front office. Doubletree by Hilton Hotels global head Rob Palleschi said Doubletree’s opening was an important milestone for their collection of more than 230 hotels and resorts. “This hotel in the heart of one of South-East Asia’s most important cities truly demonstrates the refreshing sense of contemporary style and personalised service Doubletree by Hilton continues to pursue and present to the world’s travellers, wherever they stay with us. “With five hotels now open in important business centres and attractive leisure destinations across Asia and many more deals under negotiation, the Doubletree by Hilton brand continues to gain momentum as a lucrative branding opportunity for owners and developers, which is both flexible for new-build and conversion purposes in the upscale, full-service hotel segment,” he said, adding that the property was the 235th Doubletree property in the world. Following the short speeches, diners were feted to an array of sumptuous food from Makan Kitchen, Tosca, Cellar Door, Axis Lounge and The Food Store. Sweet find: Treats of desserts for the guests. Easily identifiable as the hotel’s pride among the restaurants, Makan Kitchen has a seating capacity of 350 and promises a true Malaysian dining experience. This dining venue has three live interactive kitchens, featuring Malay, Chinese, Indian, Ibanese, Nyonya and Kristang cuisines. Besides the food, the exciting change in landscapes from an authentic Iban longhouse setting to the traditional Peranakan style was a feast for the eyes. Near the pool, one will appreciate Tosca for its roomy elegance, open-door concept and home- style Italian cuisine. Cellar Door gives diners the luxury of selecting their preferred wines while Axis Lounge at the ground floor is the place to relax for drinks. The Food Store on the other hand offers the option of having a light meal. Guests were also taken on guided tours to view the hotel’s facilities. While Lewis Pragasam and Asia Beat provided the laid-back music, ‘treemen’ were spotted dressed in camouflage as they went about in pairs and obliged for photographs to be taken. The 34-storey property which rises high in the city’s skyline has 540-guest room. Managed by Hilton Worldwide, the hotel is owned by MGPA Asia Fund II and is part of a world-class integrated property called The Intermark. Besides the hotel, The Intermark also has on site a Retail Podium, and a grade A office tower. Another project, an office building, is scheduled for completion in 2012.